After 730 days of being followed around by me and my camera I guess the minifigs inhabiting my home had enough of me. They were whispering all day, and suddenly fell quiet when I approached with my camera. I tried to get a really good photo… but they seemed to avoid me. When I walked into the cellar however I found them all; Dwaas, Barry, Darryl, Willy, The Dark family, the wanderer, Amida, Strabo, Cool Chef, Steve the Bookbunny, Crappy real estate agent, Francis etc… etc. Looks like the main cast of Foolish Lego where planning a little get together for new years eve, and I was not invited with my camera. I even saw a little bus around the corner, so I guess they are celebrating outside of the house by now. 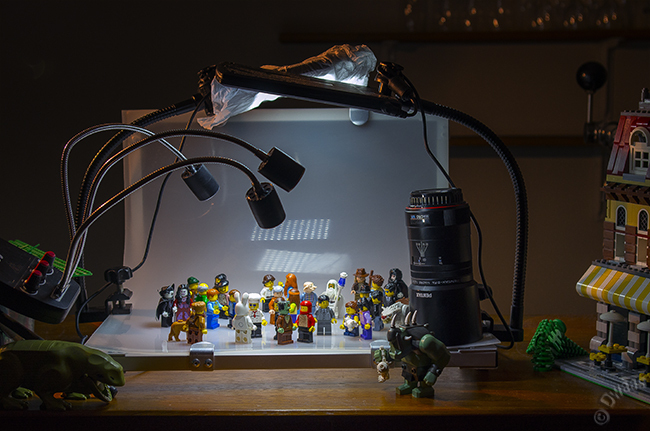 And so it ends; 730 days of daily Lego photography… I had so much fun, and met so many nice new people. I learned a lot about photography and our house has filled up with Lego (at least from the perspective of my wife 😉 ). Thank you all for your support and countless remarks by mail, twitter, the comments and in real life. It kept me going on days that I lost inspiration. So again THANK YOU ALL for you continuing support of Foolish Lego And don’t stop checking the site because new photo’s will still be made and published. The comic will go on by the way! HERE’s the latest episode of the Foolish Lego webcomic, episode 145! Congratulations on the 730 photo run, and hope you’ll be enjoying your vacation! One question: what’s this troll doing? Can’t see what’s he holding. Congratulations on finishing 730 days of photos! I’ve enjoyed each and every picture. I’ll miss seeing your daily photos but I’m glad that you won’t be stopping completely. Thank you very much Paul. Your continuing amazing and sometimes out-of-the-box Lego photography is part of the inspiration of Foolish Lego! Now I can’t look for LEGO photo relief everyday D: Wahhahahahah! I’ll still have the comic to look forward to though! Thanks Dwaas, and congrats on the 730! In unrelated news, Hooray for all the new sets that came out today! Great 365 days of pictures, I think you should keep going…..
Time has finally caught up with me. Maybe next year? What a ride… 2 years… thinking about that it’s really sounds like some accomplishment! That was an awesome job! All those cool characters you created. That is what I will remember from your 730. Cool chef, The Dark Family and other… I hope to see them again. And the past year you were there every step of the way, like a stick behind the door! Thank you for that.